A few years ago you had your beautiful custom granite countertop installed and professionally sealed. Now you are starting to notice you have to scrub a little harder to get food stains off, and are worried that the granite countertops seal has worn down. Granite countertops should be resealed approximately every 1 – 5 years, and if you are close to that mark, we highly recommend you reseal your granite countertop to maintain its protection, stain resistance, and to prevent possible damage to the granite itself. Interestingly, there are a plethora of available sealers on the market for stone such as granite. Finding the right one means looking into the claims for each product. Each product may contain different chemicals that are claimed to provide different levels of protection as far as time necessary to re-seal, easy of cleaning, and how far or deep into the granite they will penetrate. Sealants work by soaking into the porous materials of the granite, creating a hardened surface by way of reinforcing a thin layer of granite on top of the stone. Granite sealants are not meant to create a hard, chemical surface as you would find on quartz or marble. Some chemicals you may see are fluorocarbon aliphatic resin, siloxane, silane, or silicon. We recommend choosing products that contain chemicals at the beginning of the list, rather than the end. Fluorocarbon based sealers are the most expensive, but can provide the best protection over the longest period of time. While Silicon for example, will wear away quickly, increasing the frequency of resealing. Clean your granite countertop and let the granite dry to ensure all the moisture has evaporated from the granite. This is a very important step. You do not want to seal in bacteria and water, causing staining and mildew after you have sealed the surface. After cleaning your countertop and letting it dry, and after purchasing your sealer of choice, be sure to carefully and fully read the instructions on the sealer you purchased. It should be specifically for granite, and should state any warnings clearly on the label. Please follow any warnings and all instructions to ensure you are safe and the sealer works as intended. We also suggest you wear latex or dishwashing gloves, as well as eye protection and a paper filter mask to prevent unnecessary exposure to any of the sealing agents. Your personal safety is very important. 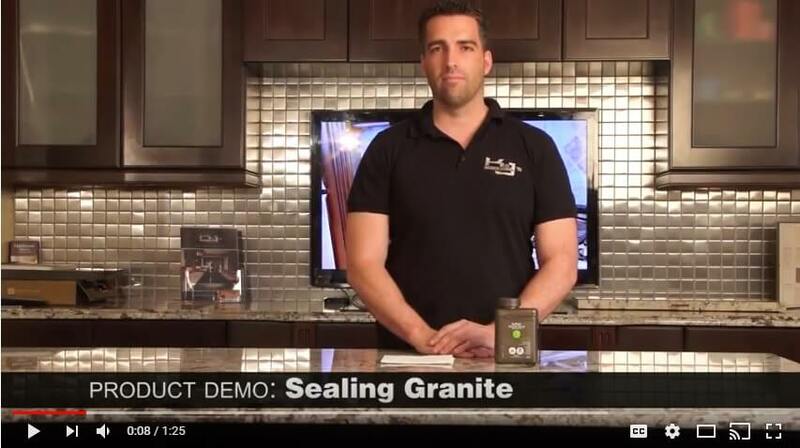 Follow the directions and begin sealing the granite. Likely you will have a spray bottle and will sweep the bottle from side to side, at a constant distance to the surface, coating the entire granite countertop. The granite countertop should be damp, but not soaking wet. Now we let the sealer absorb into the granite. The instructions on the sealer you purchased will define exactly how long you should wait. A typical time is anywhere between 5 minutes to half an hour. However, be cautious as leaving a sealer on too long can cause discoloration. You may be required to add another coat on top of the first one after it dries. Again, this is dependent on the specific product. You can use a cloth at this point to wipe the sealer over the surface, ensuring a slick and even coat. The final step is to wipe the excess sealant off the surface of the granite countertop. Use a clear, dry, non-abrasive cloth. We suggest a microfiber cloth for this stage, to prevent any visual artifacts from forming as you wipe. The cloth should absorb any excess solution. The final step is to “cure” the surface, which usually means leaving the sealer to settle in and dry over the course of 48 hours, though direction may vary, again based on the product you chose. That’s it! Your granite countertop should be properly sealed and ready to go for another few years. It is incredible how simple resealing granite countertops can be, so ensure you write it down on your calendar to remind you when the next one is due, and enjoy your newly sealed granite countertop!